To find other places to visit, ratings, more things to do, and more tourist information, use the Tomakin planner . Start off your visit on the 18th (Sat): see the interesting displays at Killer Whale Museum, then identify plant and animal life at Potoroo Palace, then take a leisurely stroll along The Merimbula Boardwalk, and finally get great views at Disaster Bay Lookout. For other places to visit, where to stay, and more tourist information, go to the Eden trip itinerary website . Traveling by car from Tomakin to Eden takes 2.5 hours. May in Eden sees daily highs of 22°C and lows of 9°C at night. Cap off your sightseeing on the 19th (Sun) early enough to travel to Newhaven. Newhaven is a town in southern Victoria, in the south Gippsland region. Kick off your visit on the 19th (Sun): step off the mainland to explore Churchill Island, learn about all things military at National Vietnam Veterans Museum, then get to know the resident critters at The Nobbies Centre, and finally look for all kinds of wild species at Koala Conservation Centre. On the 20th (Mon), you'll have a packed day of sightseeing: find something for the whole family at A Maze'N Things, then look for all kinds of wild species at Phillip Island Wildlife Park, and then take in the waterfront at Rhyll Jetty. To find more things to do, maps, where to stay, and more tourist information, go to the Newhaven travel route builder . Use the Route module to find suitable travel options from Eden to Newhaven. In May, plan for daily highs up to 20°C, and evening lows to 10°C. Finish your sightseeing early on the 21st (Tue) so you can drive to Geelong. Geelong is a port city located on Corio Bay and the Barwon River, in the state of Victoria, Australia, 75km south-west of the state capital, Melbourne. Kick off your visit on the 21st (Tue): indulge in some personalized pampering at some of the best spas and then take in nature's colorful creations at Geelong Botanical Gardens. To find more things to do, other places to visit, ratings, and more tourist information, read Geelong online day trip planner . You can drive from Newhaven to Geelong in 2.5 hours. May in Geelong sees daily highs of 20°C and lows of 8°C at night. Finish your sightseeing early on the 21st (Tue) so you can drive to Lorne. Lorne is a seaside town on Louttit Bay in Victoria, Australia. Discover how to plan a Lorne trip in just a few steps with Inspirock's itinerary builder. Getting from Geelong to Lorne by car takes about an hour. Other options: take a bus. In May, daytime highs in Lorne are 20°C, while nighttime lows are 8°C. Finish up your sightseeing early on the 22nd (Wed) so you can go by car to Apollo Bay. Apollo Bay is a coastal town in southwestern Victoria, Australia. Kick off your visit on the 22nd (Wed): trek along Great Ocean Walk, then don't miss a visit to Cape Otway Lightstation, and then walk around Paradise Picnic Reserve. Keep things going the next day: trek along Mait's Rest, identify plant and animal life at Kennet River Koala Walk, and then get great views at Mariners Lookout. To see traveler tips, more things to do, reviews, and tourist information, read our Apollo Bay trip itinerary maker tool . Getting from Lorne to Apollo Bay by car takes about an hour. Other options: take a bus. Finish your sightseeing early on the 24th (Fri) to allow enough time to drive to Port Campbell. Port Campbell is a coastal town in Victoria, Australia. Start off your visit on the 24th (Fri): explore the wealth of natural beauty at Port Campbell National Park. Keep things going the next day: explore and take pictures at Twelve Apostles and then explore and take pictures at Loch Ard Gorge. 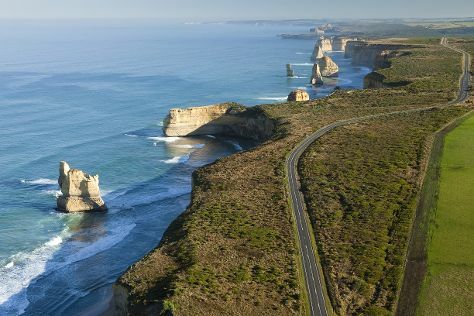 To see more things to do, reviews, traveler tips, and other tourist information, refer to the Port Campbell road trip planning site . Getting from Apollo Bay to Port Campbell by car takes about 1.5 hours. Other options: take a bus. On the 26th (Sun), wrap the sightseeing up by early afternoon so you can take a bus to Warrnambool. Warrnambool is a regional centre and former port city on the south-western coast of Victoria, Australia. On the 26th (Sun), see the interesting displays at Flagstaff Hill Maritime Village and then take in the exciting artwork at Warrnambool Art Gallery. For ratings, more things to do, and more tourist information, use the Warrnambool online driving holiday planner . Take a bus from Port Campbell to Warrnambool in an hour. Alternatively, you can drive. You will have some time to spend on the 27th (Mon) before leaving for home.